Colorful wool top & wool roving: "Wooly-n-Wild"
Perfect fibers for colorful needle felting, wet felting and spinning yarn! After finding your fiber, check out our felting equipment and supplies or see all of our fibers. Ashford Spinning Fiber Bag is a great for experimenting with color blending. Get a little of everything for your favorite needle felting, wet felting, or spinning projects. This collection includes an ounce each of 19 of our best Ashford colors. Each color of Ashford is 100% Corriedale top can also be purchased individually by the ounce or pound. The Top preparation is similar to a wool roving, but is more thoroughly combed so spins yarn easily. It&apos;s the perfect palette for embellishing picturesque scenes, children&apos;s toys, masks and more. Bring new life to an old sweater with Needle Felt embellishment. Featured item for Needle Felting on The Martha Stewart Show! Romeny is ideal for needle felting as needle holes are less evident in the work. But don’t limit its use to needle felting. Try it in traditional wet felting too but be aware the finished felt will be more rustic in appearance. Romney, a long wool breed, is named for the Romney Marsh region in Kent, England where it was developed in the early 1800’s from medieval longwool types as a dual purpose fiber and meat sheep. The extreme geographic and climatic conditions of the region developed some specific breed characteristics which include hooves resistant to footrot and big fleeces which remain heavy in harsh weather. These characteristics made for an easy transition to New Zealand and the Falkland Islands where they quickly established themselves as the most predominant breed. The first Romneys came to the United States in 1904 where their long, lustrous fleeces is highly sought by hand spinners. Our Dyed Felting Fiber is carded Romney. A slightly coarse fiber with crimp, 1/4 lb bags are convenient and lets you have lots of colors. This romney felting fiber has a staple length of 2” - 3” and a micron count of 31-34 for dyed and 38-40 for white, natural grey and fawn. Hand-dyed by Pine Star Studio for Halcyon Yarn in colors evocative of our beautiful coast of Maine. This medium soft Romney blend is a dark grey and fawn color. Recommended for learning the nuance of any handcraft application-it&apos;s great for spinning yarn, felting fiber, doll making, wet felting or needle felting. Staple length 3.5-5 inches (80-125mm). Fiber count 48s (32 micron). Hand dyed roving - do it yourself! Have You Seen Our New Fibers? Brighten your spinning and felting with colorful New Zealand Corriedale. 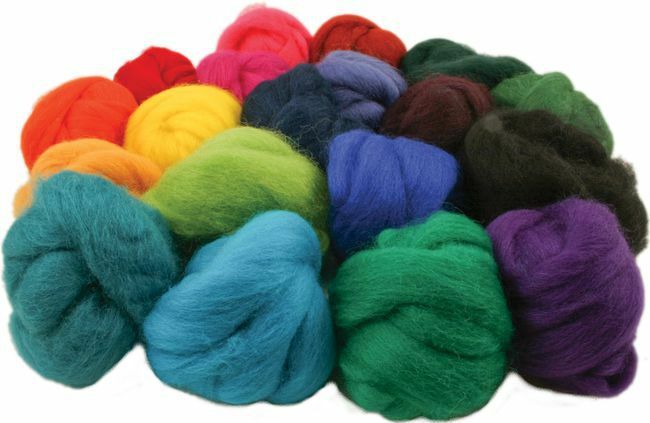 Ashford&apos;s 27-30 micron wool fiber has in a huge array of colors-ready to spin, blend and felt. Beginning spinners- This is your fiber! Its natural crimp, keeps it from slipping through your fingers quite as quickly. This bit of extra time makes it easier to focus on the mechanics of spinning. And don&apos;t forget the lure of colors. Even starting out it&apos;s more fun to spin with colors you like. Experienced spinners will enjoy playing with the range of available colors. Simply choose your desired colors and you are ready for a fun afternoon of experimentation or a more intense study in color theory. Mix, match, and card the solid colors to create subtle heathers and rainbow designer yarns. Creating a color wheel is easy with Ashford&apos;s primary colors. In need of a little guidance, look our many videos and DVDs on Fiber Preparation and Multicolor Blending Techniques. These glorious colors can be felted alone or blended to create infinite colors. By the ounce, Ashford fiber is ideal for felting picturesque scenes, masks, children&apos;s toys – any project where you need only a small amount of a specific color. Micron 27-30. Mix colors for discounts (for price 2 each color amount must be greater than 1lb). Sharing the Valentine's Day Love with Free Shipping!